How much Protein is in Beef & Steak. Protein, fat and calorie content of various cuts of steak and beef. HomeHow much Protein is in Beef & Steak. Protein, fat and calorie content of various cuts of steak and beef. The chart shows how much protein is in various types of steak, lean steak, ground beef and other meats. 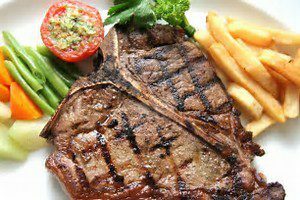 Protein content of steak, beef and meat is important to know to determine the leanest cuts for bodybuilders, those on a weight loss diet, and those desiring a healthy diet consisting of high protein foods, or where tracking protein is necessary. Toward the bottom of the chart are Omaha Steaks nutrition information, which I have taken directly from their website showing calories, protein and fat content of various cut of steak.